Entry to the barn is via a spacious hall with plenty of hanging space for coats and storage for boots and shoes, prams and pushchairs. This leads down a few steps into the open plan dining area with table and chairs for 10-14 people and the large sitting area with wood burning stove. This area has oak floors and underfloor heating. A large L-shaped kitchen is adjacent to the living area and has French doors opening on to the south facing paved terrace. A breakfast area leads to the the utility area with washing machine, tumble dryer and plenty of storage space. Also opening off the hall and down two steps is a ground floor bathroom with WC, hand basin and bath and separate shower cubicle. The ground floor also accommodates the master bedroom with four poster bed and en suite bathroom with bath and shower. Entrance to this area is up three steps to the snug/sitting area and then up and down two steps into the bedroom area. I grew up in Edinburgh, Scotland and my husband, Dave, is from Wales. I am documentary film director and Dave is a well-established photographer. We live in north London with our family, and Hollybush is our much-loved, get-away-from-it all, in the glorious Suffolk countryside. We stumbled across the barn while driving through the Suffolk countryside. At that point it was a near tumble-down wreck. The outer doors were held together by string, the cow's original trough was still intact. But you could immediately see that it would be a magnificent building once restored, and the setting was magical - miles of fields all around. Our reverie was suddenly interrupted by the farmer - accompanied by his son and shotgun! He thought we had come to steal the pantile tiles off the roof. One year later, our "dream" was complete and we've had many happy vacations there ever since. Perfect location for hosting a large group of friends and/or family. There's enough room that everyone feels they have space. Ample room for children to run around safely, and quiet spots for adults to retreat to. Sunny evening on the patio overlooking the fields with a glass of wine are a perfect end to the day! En-suite bathroom to bedroom 1 has a sunken bath, along with a double shower cubical, WC, plus his & hers sink units. Two further bathrooms, one with shower and bath, the other with bath facilities. The open lounge has oak wooden flooring, a vast open fireplace is the centrepoint of the room. The lounge boasts 3 full sized sofas, a 72 inch wide screen TV, Freeview, DVD player, and games console. A solid oak dining room table seats 14 people. The country kitchen boasts a double range cooker, American style fridge/freezer, and separate SMEG fridge freezer, dishwasher, microwave, toasters, electric kettle, blender plus all required cooking utensils. The breakfast table seats 12 guests. Large garden to front and rear with barbecue, outdoor tables and sun loungers. The property is suitable for those with mobility problems, as access is gained via ground floor entrance, additionally the property has a range of facilities on the the same floor. Outside: The barn boasts spacious grounds to both the front and back of the property. A full range of outdoor furniture is available, as well as a gas BBQ and outdoor fire pit. Utility Room: The utility room has a washing machine, separate dryer, plus hanging frames, iron & ironing board. Additional big pots and pans, and serving platters are also kept here. Cleaning / Towels / Linen / Maid service: All linen, towels and logs are provided. Other: The snug is the quiet space at the back of the property, with two squashy Heals sofas, a TV, DVD player, books and a selection of games. The property itself is gorgeous, centred around a fantastic social space. The kitchen is huge and very well equipped. We celebrated my wife’s 30th here with close family and friends and had a great time. Only comment would be that one of the bedrooms isn’t really separated from that central part so if you are a light sleeper that can be an issue. Overall loved the property and the owners were very accommodating. We stayed here for my husband and friends 40th birthday, 4 couples with children. 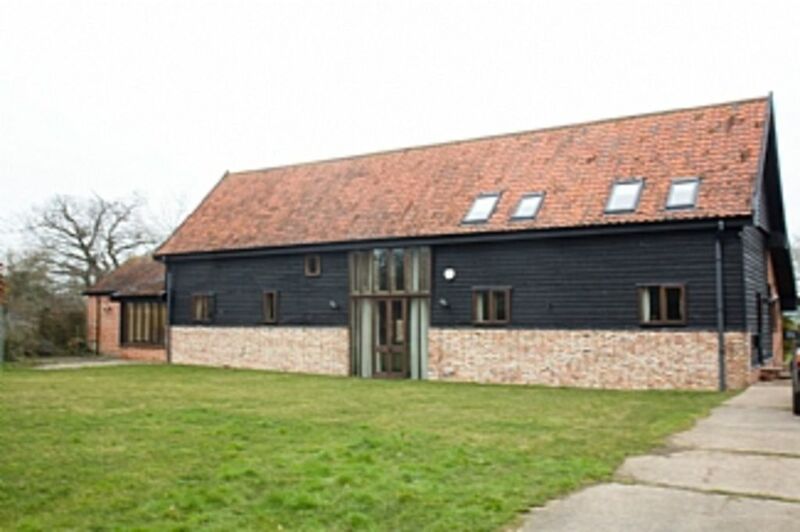 From beginning to end we had an amazing experience staying at Holly Bush Barn! The photos on the site don’t do it any justice and we walked into the stunning open living area feeling the full wow effect! Every bedroom has comfortable bed and are beautifully decorated too! Beautiful scenic views from every window! Well equipped kitchen with everything you need in a house that caters for this amount of people! Great location and 10 minutes drive from Southwolds Pier! Julie was so helpful leading up to our weekend and also when we arrived knowing everything we needed to know about the house and area!! Huge thank you! We visited the barn recently for a family gathering. The barn accommodated us brilliantly. The enormous open spaces worked really well for our group. We had a wonderful time in this characterful and well equipped converted barn. It seems to be miles from anywhere but in fact we found some lovely places within easy reach. Highly recommended. Thank you so much - I’m so glad you had a relaxing time. This place is fantastic! Was very close to a festival we were attending, and we couldn't have been luckier to find this place. - Tons of sleeping room with high quality beds, pillows and linens. Southwold beach front is approx 7 miles away by car, with its array of fashionable shops and restaurants, and award-winning beach and pier. Beccles market town is a 10 minute drive away, with supermarkets, local shops, outdoor swimming pool, and the beginning of the Norfolk broads for boating expeditions.